Cardiomyocytes are the long muscle cells that form the wall of the heart and contract and extend with every beat. Most of our cardiomyocytes are already present in our bodies when we are born, grow by increasing their size, and remain with us for a lifetime. Cell division is a rare event for cardiomyocytes, which explains why their regenerative power after a heart attack is very limited. Isolated neonatal cardiomyoctyes are an established cell model used in research to understand the interplay of cardiomyocytes with other heart cell types, such as fibroblasts and endothelial cells, in generating a synchronous heart contraction, and to uncover biochemical mechanisms and pathways that might promote regeneration. An intriguing prospect for this research is to obtain engineered cardiac tissue that could be used to surgically replace damaged heart regions. Pure and extensively characterized preparations of fully functional cardiomyocytes are at the core of this research because they ensure relevance of the obtained results. Make a viable single-cell suspension from neonatal mouse or rat heart tissue. The Neonatal Heart Dissociation Kit offers a combination of gentle enzymatic and mechanical steps to dissociate the tissue. If needed, dissect atria and ventricles to create separate suspensions. Remove non-cardiomyocyte cells from the suspension. Using the Neonatal Cardiomyocyte Isolation Kit, you can label these cells with a cocktail of MicroBead-conjugated antibodies specific for non-cardiomyocytes and deplete them magnetically, leaving pure, unlabeled cardiomyocytes in your suspension. Label cells in the resulting suspension with highly specific antibodies to analyze the enrichment of atrial and ventricular cardiomyocytes by flow cytometry (Figure 1). Efficient isolation of cardiomyocytes by depleting non-target cells. Need a detailed protocol? Want to see supporting data? 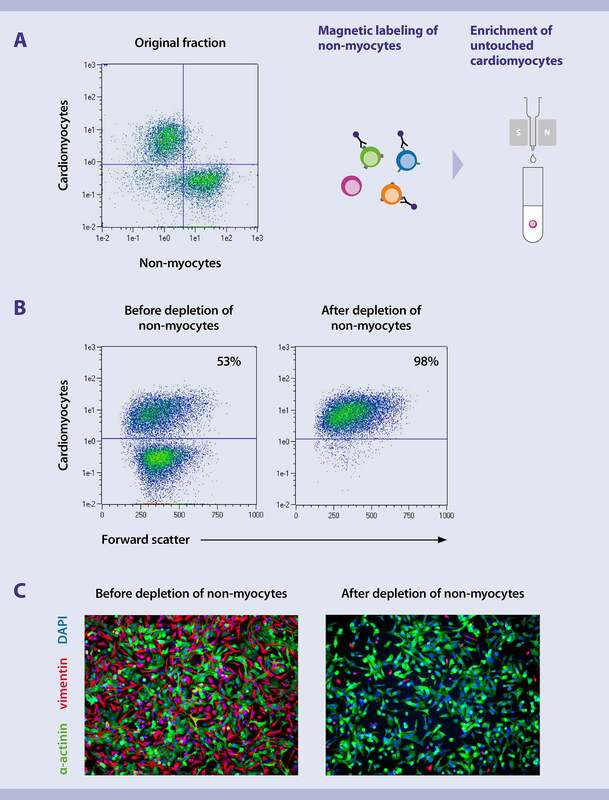 In our Application Note “Complete workflow for purification, cultivation, and analysis: Neonatal cardiomyocytes” you’ll find the materials and procedure to create a cardiomyocyte suspension and a flow cytometry analysis template to confirm enrichment. If you have further questions, we can help.